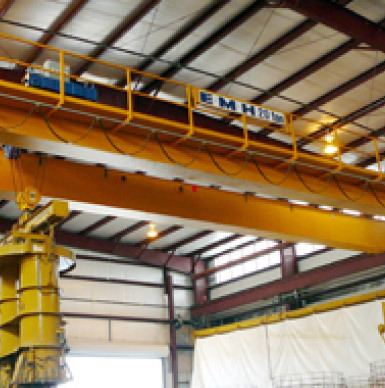 Jib Cranes from EMH | EMH, Inc.
Jib cranes from EMH include wall-traveling jib cranes as well as aluminum rail jib cranes. This type of crane, the jib crane, a common mounting device for hoists lets you leverage the jib cranes capabilities and flexibility so you’re able to locate the hoist (wire rope hoist, etc.) exactly over the load. These jib cranes provide innovation that improves productivity. Jib cranes can be provided to you by EMH with a variety of configurations including jib crane options for an abundance of or restricted work space. Jib cranes from EMH have numerous safety features built in. Because of the way EMH manufactures its jib cranes, we are able to limit unintentional movements, providing better control, greatly reducing any chance of damage. EMH jib cranes are easy to install, use, and move within your factory. EMH jib cranes and the applications they are used for can evolve with your changing needs – or simply serve as a reliable jib crane for years to come for the purpose you acquire it for.